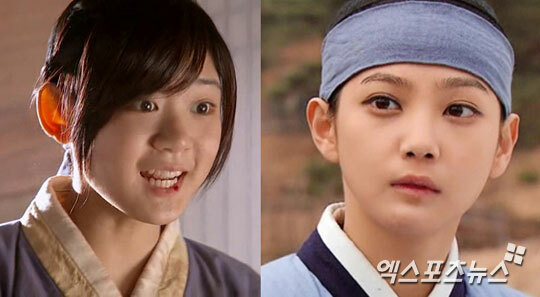 The resemblance in the beautifulness of the adult and child actresses for the character of Seol in The Moon that Embraces the Sun, Yoon Seung Ah and Seo Ji Hee, is attracting the attention of netizens. Adult actors officially debuted on the episode 6 broadcast on January 19th, 2012. The young actress Seo Ji Hee who exists beside Yeon Woo like a shadow was replaced by Yoon Seung Ah, and a lot of attention has been focused on their appearance. Before the TV series is broadcast, the resemblance in appearance between young actress Seo Ji Hee and adult actress Yoon Seung Ah has become a hot topic. After the photos of adult actors were made public, netizens said, “The facial features are very beautiful,” “The popularity of Seo Ji Hee increased very fast!” “Very surprised, but Seo Ji Hee is more beautiful,” “Looking forward to better acting,” and so on. Besides, Seo Ji Hee played the role of niece of Hyun Bin in 2005 MBC drama My Lovely Sam Soon, attracting audience attention.